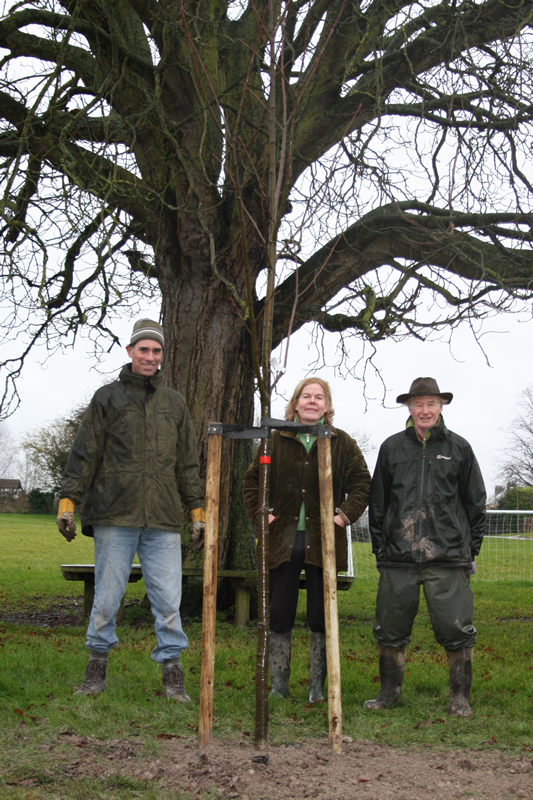 The planting took place in pouring rain on the morning of Saturday 22nd December 2012. The new tree is a Sweet Chestnut Castanea Sativa, starting with a girth of 12-14cm at a height of 1 metre from the base. It was purchased form Barchams and is a beautiful, fast growing, large tree which is particularly attractive in early summer when laden with its male and female catkins. It will also supply its fruit - hence the song "chestnuts roasting on an open fire". Subject to the approval of the Parish Council, a noticeboard will be put in place between the two trees describing them and why and when they were planted. Grateful thanks go firstly and foremostly to John Reed who did the vast majority of the planting, using his digger - and who went and got the tree from Barchams, saving us the delivery fee. Thanks also go to Within Reach magazine which purchased the tree for the village and will pay for the noticeboard in due course. In the picture you see David Thomas, Chairman of the Parish Council, Claire Halpin-McDonald, Editor of Within Reach and John Reed (who did all the work). Behind the camera is the Clerk, David Parr.